October 16 is observed as the World Food Day to mark the creation of the United Nation’s Food and Agriculture Organisation (FAO) in 1945. The world body envisions a “zero hunger world” by 2030. Perhaps, the occasion is incomplete without remembering Nobel Peace laureate Norman E Borlaug, whose “miracle seeds” of wheat saved over a billion people from starvation. Borlaug also instituted the World Food Prize in 1986, which is sometimes described as the Nobel Prize in agriculture. It’s important to understand the role of science and technology in ushering the Green Revolution, which ensured food security in India. Today, similar innovations in biotechnology hold the promise to provide nutrition security. In 1943, the Bengal Famine claimed 1.5 to 3 million lives. After independence, India faced the challenge of feeding 330 million people. The situation became grim when the country was hit by back-to-back droughts in the mid-1960s. 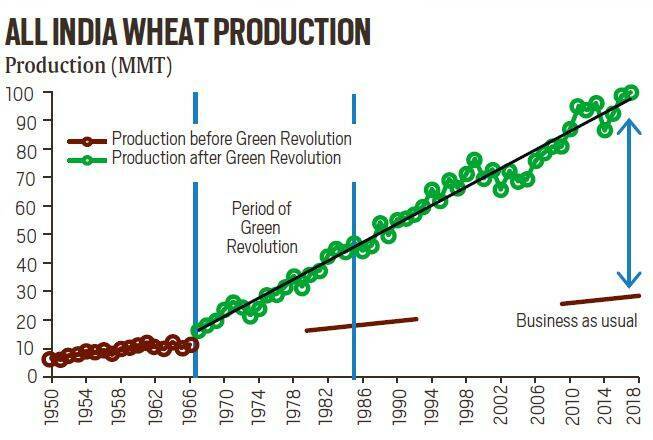 Grain production plummeted from 89.4 million metric tonnes (MMT) in 1964-65 to 72.4 MMT in 1965-66. India became heavily dependent on the PL 480 food aid from the US. Self-sufficiency in foodgrains became the country’s top policy priority. In the early 1960s, India imported 18,000 tonnes of the semi-dwarf high yielding (HY) wheat variety, Lerma Rojo and Sonora 64. Developed by Borlaug and his team at the International Maize and Wheat Improvement Center (CIMMYT), Mexico, these wheat varieties proved to be the harbinger of the Green Revolution. Indian scientists adapted the imported germplasm to create indigenous varieties: Kalyan developed by D S Athwal and Sona created by M S Swaminathan. Around the same time, the HY miracle rice, IR8 — developed by Peter Jennings and Henry M Beachell of the International Rice Research Institute (IRRI) — was imported. About a decade later, an improved variety, IR36 — developed by IRRI’s Gurdev Khush — made its presence felt in the country’s fields. The breeding programme under the All India Coordinated Research Project (AICRP) produced Padma and Jaya, the first indigenous HY rice varieties. These became the centrepiece of India’s rice revolution. Breakthroughs in Basmati rice came with the development of Pusa Basmati 1121 and 1509 from 2005 to 2013. These rice varieties were developed by teams led by V P Singh, A K Singh and K V Prabhu at the Indian Agriculture Research Institute. Pusa Basmati gave Indian rice more value with less water and 50 per cent higher yields compared to the traditional basmati. V Singh et al estimate that the cumulative earnings through exports of Pusa Basmati 1121 between 2008 and 2016 and the sale of the rice variety in the domestic market in the same period to be about $20.8 billion. Where does India stand today in terms of wheat and rice? 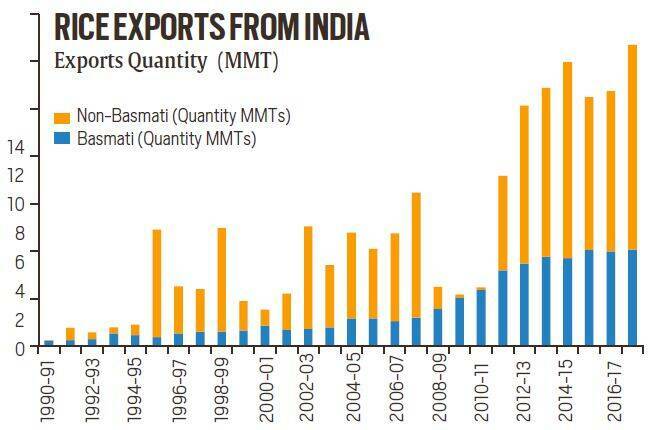 While the country’s population has grown by more than four times, from 330 million in 1947 to 1.35 billion in 2018, India’s wheat production has increased by over 15 times in roughly the same period — from about 6.5 MMT in 1950-51 to 99.7 MMT in 2017-18. India contributes about 13 per cent of the world wheat production, next only to China whose share is about 17 per cent. Rice production has shot up by about 5.5 times — from 20.6 MMT in 1950-51 to 112.9 MMT in 2017-18. India has a 23 per cent share in world rice production, next only to China whose share is about 29 per cent. India is also the largest exporter of rice in the world with about 12.7 MMT, valued at $7.7 billion (Basmati at $4.17 billion and Non-Basmati at $3.56 billion) during 2017-18. Source: Agricultural Statistics at a Glance, Department of Agriculture, Cooperation and Farmers Welfare, Government of India, Agricultural Processing and Export Development Authority (APEDA), Government of India. Notwithstanding its foodgrain surpluses, the country faces a complex challenge of nutritional security. FAO’s recent publication, The State of Food Security and Nutrition in the World, 2018 estimates that about 15 per cent of the Indian population is undernourished. More than 38 per cent of Indian children aged below five years are stunted and 21 per cent suffer from wasting. Several factors ranging from poor diet, unsafe drinking water, poor hygiene and sanitation, low levels of immunisation and education, especially that of women, contribute to this dismal situation. But latest innovations in biotechnology that fortify major staples with micro nutrients like vitamin A, zinc and iron can be game changers. Globally, the HarvestPlus programme of the Consultative Group on International Agricultural Research (CGIAR) is doing lot of work in this direction. In India, the group has released the iron-rich pearl millet. The Indian Council of Agricultural Research has independently released zinc and iron rich wheat (WB 02 and HPWB 01), rice (DRR Dhan 45), and pearl millet (HHB 299 and AHB 1200) in 2016-17. This could possibly lead to the next breakthrough in staples, making them more nutritious. 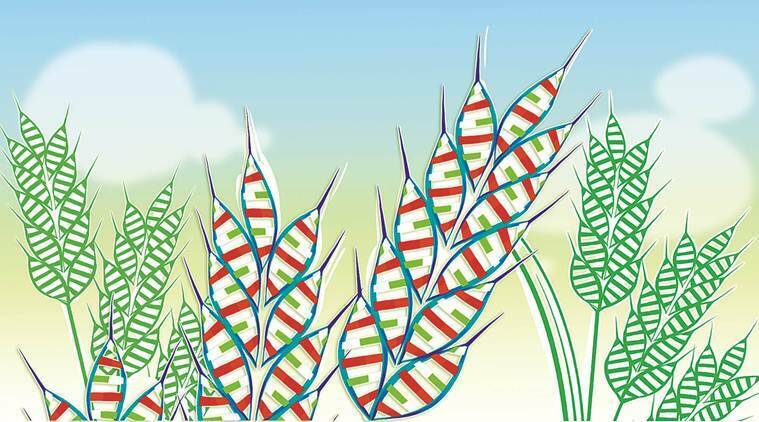 A research team led by Monika Garg at the National Agri-Food Biotechnology Institute in Mohali has innovated biofortified coloured wheat (black, blue, purple) through crosses between HY Indian cultivars (PBW550, PBW621, HD2967) and coloured wheat from Japan and America. These are rich in anthocyanins (antioxidants such those found in blueberries) and zinc (40 ppm compared to 5 ppm in white wheat). Farmers of the Borlaug Farmers Association from Punjab and Haryana have been roped in to multiply production of this wheat variety. This seems to be the beginning of a new journey, from food security to nutritional security. The best is yet to come. But innovations in biofortified food can alleviate malnutrition only when they are scaled up with supporting policies. This would require increasing expenditure on agri-R&D and incentivising farmers by linking their produce to lucrative markets. Can the Modi government do it? Only time can tell.